Boston, June 20, 2018, — There will soon be new rules surrounding nightly rentals in Boston. You might have heard this on radio as Boston City Councilor Michelle Wu spoke about her support for these new rules on local radio stations. On June 13, the Boston City Council voted 11 to 2 to approve a new ordinance, regulating corporate home-sharing platforms such as Airbnb.com. Mayor Walsh signed the bill two days later. On January 1st, 2019, the bill will be put into practice, effectively limiting short-term rentals to owner-occupants of the properties. 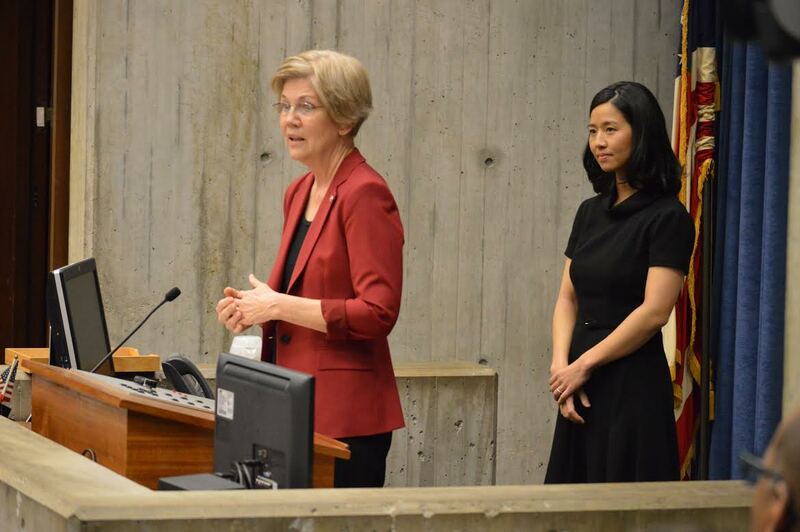 Senator Elizabeth Warren introduces Boston City Council President Michelle Wu (Jan. 2016 file photo). I sat down with Councilor Wu, a key supporter of the bill, to find out how it will affect Boston residents. If you own and live in your home, you will still be able to rent it out using a platform like Airbnb. However, this regulation will ban people who own but don’t live in their properties from doing short-term rentals. Renters will also not be able to conduct short-term renting. With rent in many major cities reaching record highs, residents are starting to call it a housing crisis. Boston consistently ranks as one of the most expensive in America. With the average rent in Boston rising to $2,152 this year, many people call the lack of affordable housing a public health crisis. There is much speculation on the actual effect of home-sharing platforms on rent prices. A 2016 University of Massachusetts Boston study found that there has been a 0.4% increase in local rent prices due to increases in the number of Airbnb listings. The study predicted that if Airbnb’s growth rate in 2015, 24%, were to continue for the next three years, Boston’s mean asking rents in 2019 would be $178/month higher than in the absence of Airbnb activity. However, it seems that the passing of this bill will slow the growth rate of the company in Boston. As far as the actual enforcement of the new rules, there were detailed provisions included in the bill. The bill requires new technologies to maintain databases of anyone who is listing short-term rentals. There will be financial penalties on any home-sharing platform that does meet the requirements. Not everyone is a fan of the bill. With the failed amendment to allow investor units, some say that it will merely shift the financial pressure from downtown Boston to surrounding areas. With limited data and much debate over the effect of such an ordinance, the next year will be a chance to observe the real impact these new internet-fuelled industries have on the supply of affordable housing and residential quality of life. Residents of Boston Chinatown have protested against AirBnb for eroding the affordable housing stock in Chinatown over last few years. State Senator Joe Boncore and State Rep. Aaron Michlewitz, both representing Boston Chinatown, spoke at one of the protests in front of State House in support of the protesters. Link to UMass Study can be found below.